PROVIDENCE, RI -- Austin Master scored a pair of goals, giving him seven points in the 2019 EHL Playoffs, and the Philadelphia Little Flyers hung on to beat the East Coast Wizards by the final score of 4-3. 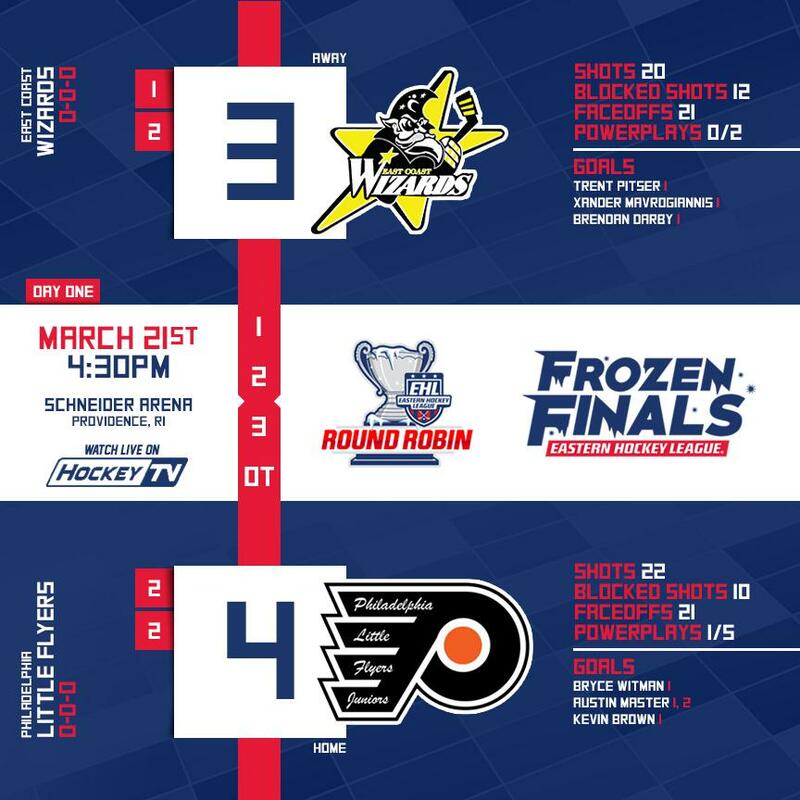 Below you'll find all of the goal recaps from the first game of the 2019 EHL Frozen Finals. Just over 3 minutes into the game, Bryce Witman collected a cross ice pass from Nate Dunning and set him on a breakaway. After Lutz made the initial save, Witman capitalized on his second opportunity to give the Little Flyers a 1-0 lead. Just 42 seconds later, Trent Pitser put the Wizards on the board after a scrum in front of the net. The Little Flyers took back the lead when Austin Master gathered a pass from Nick Daluisio and beat Lutz over the shoulder from a shot at the left hashmark. At the 17:19 mark of the period, Master scored his second goal of the game on the power play off a rebound chance to put the Little Flyers up 3-1. Just 34 seconds later, Kevin Brown gave the Little Flyers a 3 goal advantage, scoring off another rebound opportunity. 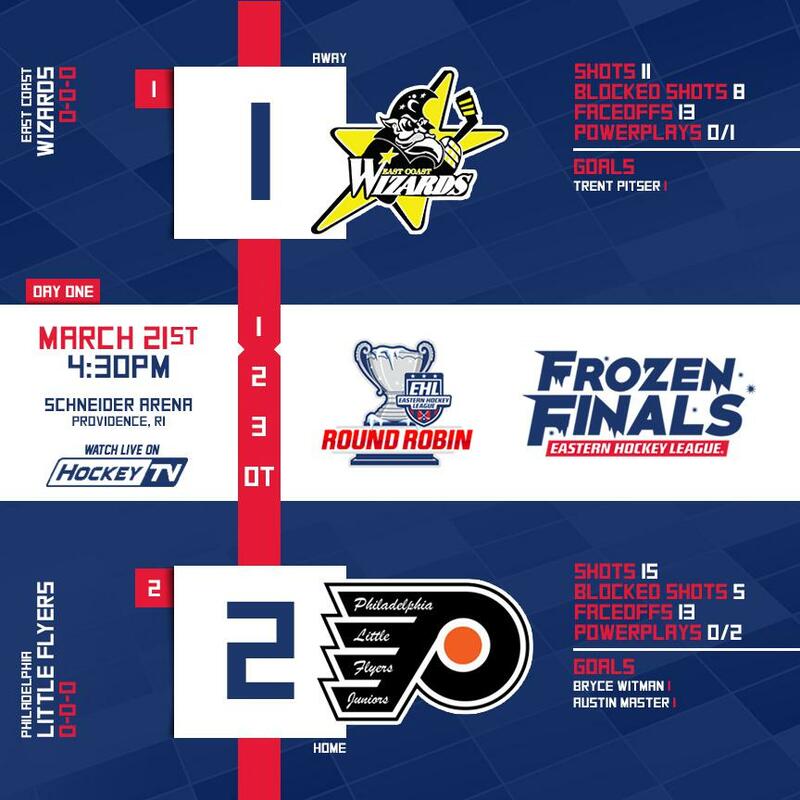 At the 8:20 mark, the Wizards made it a 4-2 game after Xander Mavrogiannis found the back of the net with assists from both Herman Lundback and James Nash. In the final 2 minutes of the frame, Brendan Darby made it a 4-3 game after converting from a chance in the slot. Both Harris Colvin and Gabriel Gagnon assisted the goal. Recently named EHL Goaltender of the Year, Brendahn Brawley, was able to hold off the Wizards, stopping 10 shots in the period in route to the 4-3 win.